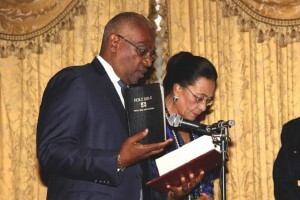 NASSAU – Declaring it was a new day in The Bahamas, Dr Hubert Minnis was sworn in as the country’s fourth prime minister last night, promising to chart a new course in the country. “I again thank the Bahamian people for reposing their trust in my party,” the victorious Free National Movement (FNM) leader said in a brief maiden speech at Government House. Dr Minnis, who faced two challenges to his leadership of the FNM and was ultimately removed as Opposition Leader last December, got the ultimate revenge on Wednesday after he decimated the Perry Christie-led Progressive Liberal Party (PLP) at the polls. Unofficial results show the FNM capturing 34 of the 39 seats in Parliament. The new Prime Minister however signaled that with the general election over, he was ready to get down to the business of governing a country where all citizens “join hands and hearts” to chart a new direction. “I pledge an unwavering commitment of congeniality, collaborative and collective responsibility. Ours is an extraordinary system of governance,” he said. On election night, he had told supporters the FNM administration would not take the “awesome mandate” given to it lightly, and promised that he would lead a people-centred government. Dr Minnis also served notice that his immediate priority would be to restore hope and prosperity to the troubled economy. “We have much work to do putting the financial and economic affairs of our country in order. We have much work to do to combat crime and violence. We have much work to do bringing social improvement and saving our young people who are at risk. “We have much work to do carrying out our plans for infrastructural development in New Providence and the Family Islands. But I am ready. My colleagues are ready. And I know the Bahamian people are ready for this new day. We go now to begin the work of mounting a new government and governing in the best interest of the people,” he said.